A great song and interesting video with animation that on the surface seems to speak of the “workaday” life of many of us in the modern world. The Kinks sang “All life we work but work is a bore, if life’s for livin’ what’s livin’ for?” This song portrays that “work” as something of much greater potential for disillusionment and dehumanization than mere boredom presents. “Sixteen Tons” was not nearly so hopeless in its situation, for two reasons. The first was that the lie “St. Peter don’t you call me cause I can’t go, I owe my soul to the company store” is really a statement of sarcasm, and thus a declaration that his soul, and even his body, cannot be enslaved. He is essentially more than a beast of burden of “muscle and blood, skin and bone” because he was “made out of mud.” This alludes to the creation of man by God from the ground as narrated in Genesis. Therefore man was not made for enslavement by men, but for freedom under God. He thus can rise up against injustice with his “fist of iron, the other one’s steel, And if the left don’t getcha, then the right one will.” Of course the picture here is the rising up of trade unions that sought the fair treatment of laborers and most will agree began as a positive force against injustice. 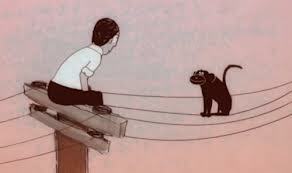 But “Monkey on a Wire” does not seem to present any “earthly” solution. It seems rather to be quite hopeless in its deadly portrayal. Jesus certainly overcame hell, so is “Monkey on a Wire” saying that ultimately the enslaved laborers will also overcome, not just in their present escapist soulical existence of “balancing above” but in a full bodily resurrection, ascension, and return for judgment and justice? There is one other line that contributes to the question. This raises many more questions, some of which I will list here. Is the dualistic “below/above” existence really “made tolerable” even if there is no present hope for an earthly solution? Is the song really hinting at and hoping for a future earthly solution such as that expressed in “The Lord’s Prayer” with the words “Thy Kingdom come, thy will be done on earth as it is in heaven.” In other words is the hope for body/soul integration in a just society in the “kingdom of God” that is in some sense coming now and will one day fully come the ultimate hope of the song? The way the song ends, with the repeated refrain “waiting for the next monkey on a wire” seems to present a somewhat ambivalent ending. Second, although the “leader of the choir” is waiting for the next monkey, he is in essence waiting for another person that will contribute to the critical mass that is involved in his own demise and judgment in the justice of God. Karl Marx saw that religion acting as the “opiate,” can cause people to tolerate the intolerable, and therefore as the reason that it should be cast off. The problem with the view of Marx, from a biblical viewpoint, is that by not believing in a transcendent God that does hold humans accountable, and who brings them to judgment both within history and at the final apocalypse, Marx cannot see that God does make a real difference in existence. The book of Revelation is the manifesto that Marx should have studied, where it shows how the witnesses against the unjust system, even if they become martyred, eventually are vindicated. In the words of “Monkey on a Wire” the “voodoo in their eyes” allows them to “go straight-on into hell” and come out victorious. Hanns Lilje knew that different view of life, was not a real answer. Intolerable problems need real solutions. It is interesting that “Monkey on a Wire” does not seem to present a “gnostic” or in the words of Hanns Lilje a “new consciousness of existence” solution. (I interacted with gnosticism in another post, where I included a short but scholarly video discussion of gnosticism.) As I mentioned earlier, the lyrics may not sit comfortably with some of us, but they may point toward the only solution beyond mere escapism. I am not oblivious to the possibility that Jesus goin’ straight on into hell could be viewed as defeat, and that “no fear” and “voodoo” in their eyes could signify a literal type of possession or hypnotism rather than my interpretation of voodoo given earlier as some hidden primal power or even love. This either/or is really only to ask and answer the question whether the death of Christ was part of his defeat or part of his victory, a question that the Apostle Paul was fully aware of, since the Jews and Greeks both stumbled on the very concept of a savior that was crucified. But Paul knowingly staked his life on the side of victory, knowing that in a sense Jesus “became” the Savior and Lord by being crucified. I always appreciate any thoughts, questions, implications, or critiques. Therefore, any of these from the reader are greatly appreciated. Many thanks in advance! “Likes” are also much appreciated because it helps me know if I’m posting things of interest to you. So, what do you think? Do you see what I see…or do you think I took the ball and ran? This entry was posted in Art, God, History, Individuality, Love, Music, Popular Culture and tagged Alt-country, Book of Revelation, dehumanization, Escapism, Gnosticism, Hanns Lilje, Injustice, Irony, Jesus, Jimmy Cliff, Judgment, Karl Marx, Kasey Chambers and Shane Nicholson, Love, Merle Travis, Monkey on a Wire, Music, Opiate of the People, Sixteen Tons, Slavery, Tennessee Ernie Ford, Totalitarianism, Voodoo, Work.